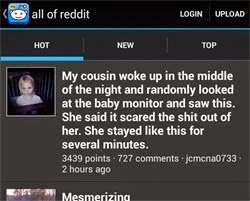 Reddit also known as the front page of the internet, is a social website where anyone can share anything. The site is popular for sharing funny and entertaining pictures, discussing on different topics and the controversies it generates. This open source code website is quite popular with hundreds of millions of visits, posts and billions of page views. But the thing about Reddit is that it is not integrating itself to social media and mobile. With the advent of social media websites like twitter and facebook, we find more and more websites integrating their features to be more social. But reddit chooses to be different. Similarly with the rising use of mobile phones for browsing the net, websites have a mobile version or even an app. But reddit is chooses not to do so. Most people would expect that there is one but there is no official app of reddit for Android or iOS or any other mobile platforms available today. But since reddit is open source and has apis, people have created unofficial but fully working apps for reddit. 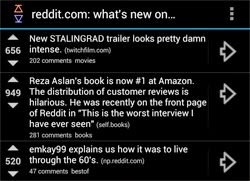 In this post, I am listing 10 of those free apps suitable for browsing reddit. 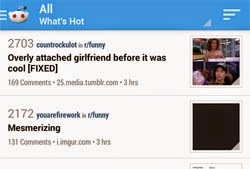 reddit is Fun is the most popular application for browsing reddit on your phone. It is rated 4.7 by 124,341 votes as with 1 million to 5 million downloads as of now. The app has every feature required to browse reddit. You can vote on posts, open the contents/link of the posts or the comment section. All these happen within the app itself and no external browsers are use although there is an option to do so. There are also many other options such as managing themes, multiple accounts, selecting specific subreddit and so on. However, I have to say that this app displays advertisements integrated into reddit which supports the developer and his hard work. This is another good Android app for browsing reddit which is also ad supported. The layout presents a fresher view than reddit is fun. You can easily see the front page of the internet, what's new in it, the rising posts and other top and controversial posts. You can also swipe through posts to move on to the next post quickly. There is a free and also a paid version of this app. The free version is enough for all your reddit browsing needs if you do not mind the ads. 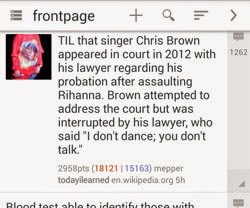 reddit is famous for its funny and controversial pictures. There are also pictures that are just awesome in every way. This is an app targetted towards users ho want to just browse the picture in reddit. This app features many subreddits such as /r/funny, /r/aww and /r/pics to name a few. 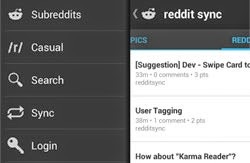 reddit sync is another good app for redditors who want to browse it in their phones. Layout is not that similar to reddit, but you can easily find all the functions of reddit in this app. You can easily submit link posts and text posts, vote on comments and posts while getting to see different parts of reddit and subreddits. 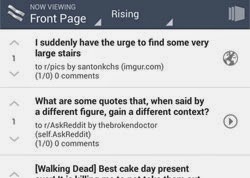 A nice looking app for redditors that can help you perform all the reddit functions while browsing it in your phone. You can easily sort how the app loads the homepage. You can sort by what's hot, what's new, what's rising. There are also options to sort reddit headlines by their hourly, daily, weekly, monthly and yearly performances. 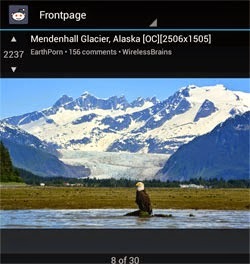 The app looks a lot cool as you can swipe across topics to bring up the options to upvote, downvote and comment on them. This app is also advertisement supported but its cool layout is worth it. Flow for reddit or simply flow is a simple app for browsing reddit. 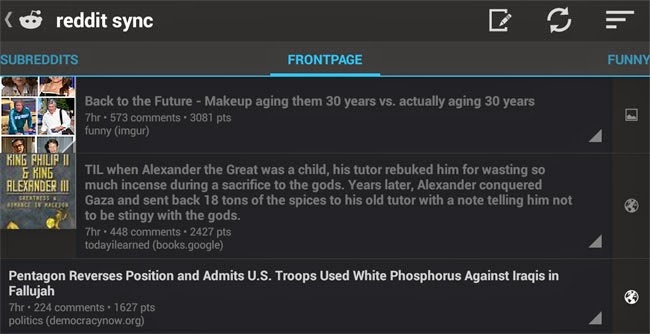 The frontpage of this app is populated with reddit headlines and you can click on the size to reach the comments or the content of the link directly. You can also click and hold on the topic for some time to upvote and downvote them. When you click on a topic, you are taken to the content like images or to the text posts where you can comment. This app is still in alpha and I think a lot of improvements will be put forward by the developer(s) in the future. This app is titled "Reddit in Pictures and that is what it does. When you load the app on your phone, you will see a single topic and the picture associated witih the link in the topic. You can just slide through the topic using the swipe motion on your screen and you will be presented with the next picture belonging to the next post of reddit. There are every possible sorting options available. You can also select the subreddit you want to go to. This app has ads but you could easily disable it by reviewing it. Overall, this is a great program to browse just the pictures of reddit with ease. Reddit Now has a clean magazine like layout which displays the headline from reddit, one of the world's most popular headliner. The contents of the post like pictures are already loaded below the topic name. You will just have to scroll through the topics on your phone to get to the next one. You can also upvote and downvote after you login. 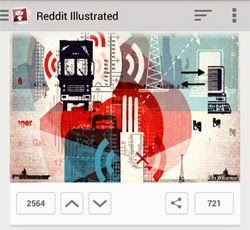 Reddit Illustrated is a great way to browse reddit on mobile. This app also displays reddit in a mobile magazine like view. Scroll and get to the next topic. The menu on the left will allow you to change topics and subreddits. Other reddit features such as sorting, logging in, commenting, voting (upvote and downvote) etc are all do-able from within the app. Diode Reddit Browser or just Diode is the final app for reddit that we are listing here. There were tons more, some were free and some were paid, but I decided to list only 10 and this is the final one. This app allows you to login, pic subreddits, submit links, sort reddit, change themes, open in browser and search through reddit. This app is simple while providing all the features a dedicated redditor needs.